How to get rid of the pacifier is something I talk about nearly everyday.For parents cautiously considering paci-elimination tactics, I share my four favorite ways to say goodbye and trouble shoot for success. Many times, the conversation about the pacifier becomes an all-consuming topic at the visit. Rightly so. As many mothers know, just the thought of getting rid of such a treasured piece of plastic can make us break out in a cold sweat. My son was nearly 2-years-old, and a pacifier addict. Ever since he was in a bassinet at our bedside, “Pass” was a devoted partner. A trusted friend. And as much as my son needed it, I needed it. Pass made car rides bearable, and kept nap-time insured. With each passing day, however, I knew the time to get rid of the pacifier was coming. Honestly, a small part of me was tired of scouring the house for them, washing them, and stepping on them. However, I was so completely anticipating such a painful disruption in an otherwise beautiful paci-partnership, that I kept dragging my feet. Then, during an otherwise unsuspecting drive home, my husband and I joined in solidarity. We agreed. This was going to be the night. “On one condition,” I firmly added. I wouldn’t - couldn’t - be the one to deny my sweet son’s nightly request for his pacifier. And so, it was agreed. My husband bravely prepared for the intervention. That same night, we bathed the kids, just like normal. We gave happy bedtime hugs, just like normal. We read stories, just like normal. At that point, however, my fearless husband simply picked up our son and headed to his room. He closed the door behind him. I prepared my daughter for the anticipated onslaught of fury. I told her that little brother may cry because he is going to be angry. As if she instantly understood the battle that was beginning, she whispered her reply. With that vote of confidence and another goodnight hug, I went to take a shower. I was envisioning the rage, and red-eyed protest. The thrashing. I wanted the rumble of the shower to dull the noise. I washed my hair 3 times, just to keep the water running. I finished getting ready for bed and headed towards our family room. Along the way, I passed the room of a quietly sleeping little boy. “Really?” was all I could mutter, stifling my disbelief. The next two nights led to a early awakening from our little guy, but otherwise passed rather uneventfully. I could not have been more proud of him for being “so big.” He calmly let go of a little bit of plastic that had been part of his life for 22 months, without a terrible fuss. I am adding a fifth. #5. Call my husband. 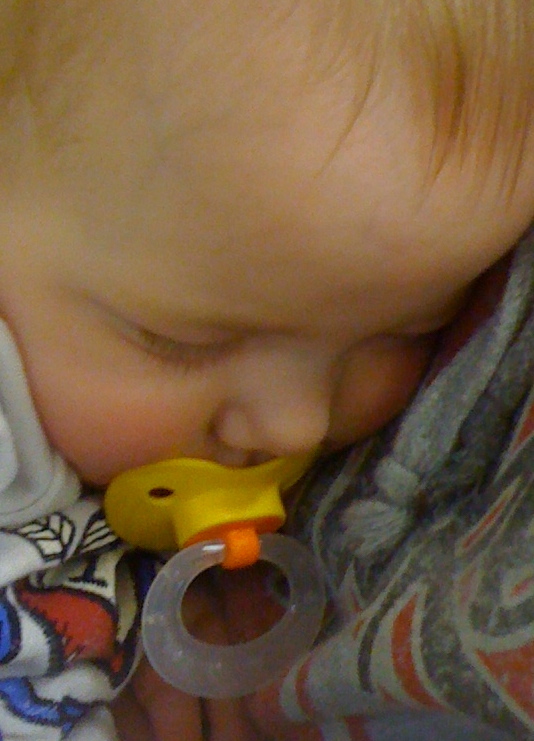 He is a paci-whisperer.